Windows tablets are about to get a whole lot more Office-y. Mere moments after announcing that Windows RT tablets are receiving a version of Outlook 2013 with the Windows 8.1 update, Windows CFO Tami Reller also said that all small-screen Windows 8 tablets will ship with a free copy of Office Home & Student 2013, starting with the recently announced 8-inch Acer Iconia W3. Diminutive Windows 8 tablets won't be receiving Outlook, but they will include Word, PowerPoint, Excel, and OneNote. The news isn't exactly a surprise: For months, rumors have swirled that Microsoft was offering manufacturers deep discounts on Windows and Office licenses destined for small screen, touchscreen Windows 8 devices. Reller and the complimentary Windows blog post left one key detail murky, however—it never mentioned just how small a Windows tablet needs to be in order to qualify for Office inclusion. Engadget grabbed a Microsoft rep at Computex, who said the deal is good for all devices with sub-10-inch screens. I've reached out to Microsoft and will update this post when the company gets back to me with the hard details. Update: Microsoft representatives say the company is delving into screen size specifics at this time. 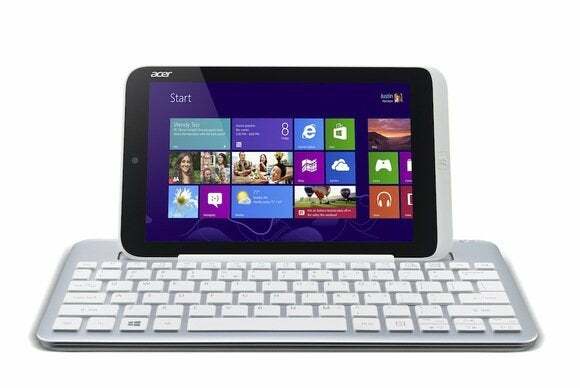 Acer will offer a keyboard accessory for its 8-inch Iconia W3 tablet, which should make the bundled Office 2013 software all the more useful. While tossing in Office gratis is a great way to differentiate diminutive Windows 8 tablets from the Android horde and the iPad mini, the shift to small screens—even with Office and the Windows 8.1 update—likely isn't enough to cure Microsoft's tablet blues. Tiny tablets are more often used for consumption than creation, and while the modern UI and apps should stand up well, the Windows desktop will probably be too small to navigate comfortably on a sub-10-inch screen. That said, Windows 8.1 and the inclusion of Office on small screen devices show that Microsoft is committed to making its modern UI-tinged operating system more appealing to the masses. Acer's Iconia W3 is priced at $380—a mighty fine price for a machine that comes with Office baked-in. Asus officials have said they expect small Windows 8 tablets to wind up below $300 to better compete with low-cost Android devices like the Nexus 7 and Amazon's Kindle Fire.